36 letters, broadsides and booklets about the revival of Hebrew language and the "war of languages", issued by the Hebrew Language Committee, "Gdud Magine HaSafah" (Battalion for the Defence of the Language) and other organizations that worked to spread Hebrew as a spoken language in Palestine. Palestine, 1902-1947. 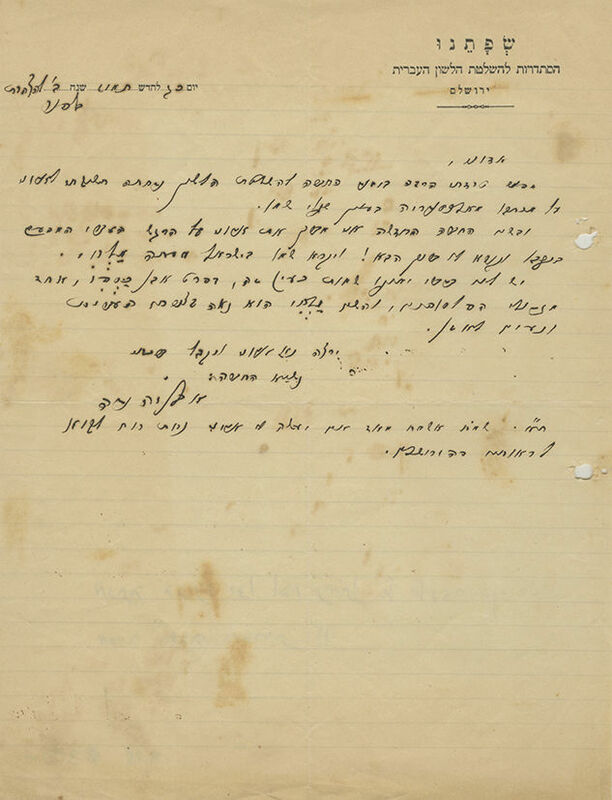 In the collection: • Letter from Avraham Eisenstein (Aldema), dated 1913, reporting a strike by students in "Ezra" school in Jaffa, seminary students and the School for Commerce in Jerusalem during the "languages war". At the end, Aldema declares: "Under no circumstances will I agree that in the 'Technikum' and the 'Reali School' teachers and students will use German. There are many more like me who will fight to their last drop of blood…". • Two autograph letters hand-signed by Eliezer Ben Yehudah, addressed to Dr. Alexander Malchi. In the first letter, written on an official stationery of "S'fatenu, Histadrut LeHashlatat HaLashon HaIvrit", Ben Yehudah suggests to Malchi to change his name "Salzman" to "Malchi", and in the second letter, written on stationery of "Va'ad HaLashon HaIvrit", he replies about medical terms in Hebrew. • Two more letters addressed to Malchi, written on "Va'ad HaLashon HasIvrit" stationery, regarding language matters. • Five letters, some handwritten and some typewritten on official stationery of "G'dud Magine HaSafah", about various ways to impose the use of Hebrew. 1924-1928. The original envelope is enclosed with one letter addressed to Avraham Aldema. • Two handwritten leaves – draft of an address by Prof. Joseph Klausner, titled "Needs of the Hebrew language at present" (1930). • 14 broadsides and printed paper tags distributed by "G'dud Magine HaSafah HaIvrit": public notice calling the public to use Hebrew in transportation vehicles; two "Bikoret" tickets; 11 paper tags with slogans such as "Ivri, Daber Ivrit! ", "Safah Achat – Nefesh Achat", "Techiyat Safah – Techiyat Am!" and more. • Letter to JNF management, typewritten on stationery of "HaMosad LeLashon uLeTarbut HaIvrit" and signed by Prof. Joseph Klausner, requesting the renewal of annual funds allocated by JNF to the organization during Ussishkin's days. Dated 1.4.1947. • and more. In addition, this collection includes three booklets: •"Milon HaLashon HaIvrit BaZman Hazeh", by Eliezer Ben Yehuda. Machberet 1. "Hahashkafah" printing press, Jerusalem, . The first booklet of the Hebrew dictionary composed by Ben Yehuda. • "HaGdud, Techiyat Safa – Techiyat Am, Choveret LeInayane Safa, Noar VeSifrut", published by "Gdud Magine HaSafah", Tel Aviv. Issues from Kislev 1923 and from Shvat 1924.